“Seeking Bliss” deals with the sense of happiness. It’s not a study, rather a personal approach on the notion, embodied through the dancers’ relationship. 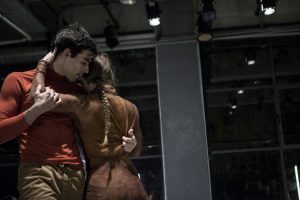 Alternation of emotions and different aspects of their relationship unfold on stage, with the two of them, transforming from adults to children and vice versa. The audience becomes a witness of their personal and shared happiness. Music creates a discrete, but at the same time strong emotionally environment, leaving space for the choreography to lead the action. Things you (don’t) have the time to feel. Things you (don’t) have the time to see. Small gaps. Moments of happiness. But your hair gets in your face and keeps you from seeing. What if you freeze time? Travel with me. Hold me tight. My legs cannot hold me anymore. Cause what I feel has pierced me. If I share some of this weight with you, everything will be brighter. Stand here. Near me. Look how the wind blows my hair. To share some of this weight with you? To take my hair out of my face? And if not, I’ll stay here forever. Listen to this song. It brings tears to my eyes, but I feel an indescribable happiness. Copyright © 2015 StillPilgrimParadox. All Rights Reserved.